Breaded Pepper Chicken recipe by Sabiha at DesiRecipes.com. Marinate overnight with Soya Sauce, Salt , Ajinomoto, Pepper and Chilli Sauce. 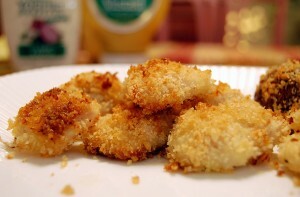 Roll in Breadcrumbs and fry till golden brown. do you mean why do you use breadcrumbs?????? what do u use for breadcrumbs? ?